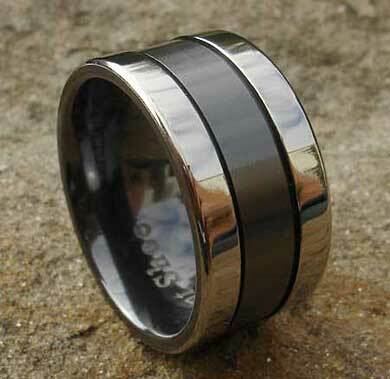 Unusual Men's Two Tone Wedding Ring : LOVE2HAVE in the UK! 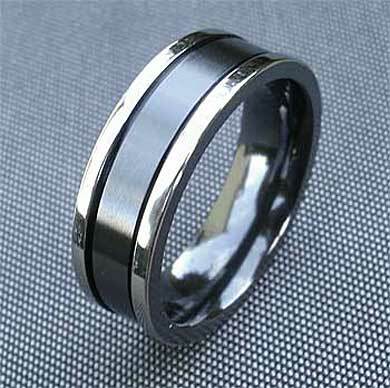 A two-tone zirconium men's wedding ring with a relieved satin finish black centre and polished edge rails that make's an awesome men's ring with an eye-catching contrast between the black and natural zirconium colouring. As pictured, the wider 10mm or 12mm version is an impressive beast of a ring with wider edging which accentuates a more chunky design style. The central black is defined further by single grooves dividing it from the silver coloured outer rails. The modern and unusual styling is perfect for men looking for a real alternative fashion statement to their rings, and just like titanium, zirconium is also hypoallergenic, so the wearing of this wider ring won't react with your skin on hot sticky days. 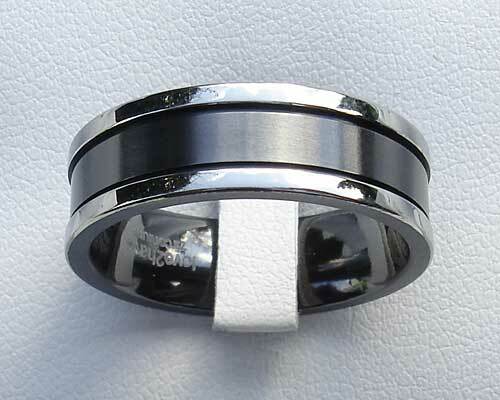 Thinner widths such as 5mm are suitable for ladies too, making this ring design an excellent choice for something matching and alternative for him and her. Width(s) Available: 5mm - 12mm. Finish(es) Available: Polished and matt combination.